What does being a follower of Jesus mean to you? There are many things that come to mind, but for us, service to others stands out. Jesus said of himself that he did not come to be served but to serve. Throughout the gospels, Jesus highlights self-sacrifice as a characteristic of a good and faithful servant; those who give up their lives in the service of others. It is these people we want to honour in this, our 30th year of ministry. For three decades we have been privileged to partner with people in other countries who dedicate their lives to others who are in need. Three of these servants are Suhaila Tarazi from Gaza, Ethel George from Vanuatu, and Millicent Wambugu from Kenya, all of whom have taken up the mantle of leading in difficult places, giving up much personally in the process. This Easter Appeal will be supporting the extraordinary efforts of these wonderful servants. Will you help us support them? Suhaila, Ethel and Millicent have sacrificed a lot; they don’t have to do what they do. Instead they willingly take the challenging path. They do this because they follow Jesus, the Servant King. Normally, a king is one who is served by those around him. His is a life of luxury and privilege where many of the daily tasks that the rest of us do are done for him. The life Jesus lived, however, was a life where service of others was the priority. When two of Jesus’ disciples asked to be seated at his right and left when he came in his kingdom, he didn’t rebuke them for desiring greatness; instead he redefined what ‘being great’ means – what it means to God. If they wanted greatness, they should first be great at serving (Mark 10:35-45). God desires a heart that is inclined towards humility and serving others. Jesus demonstrated this time and again in his own life. It was on the night before he died that the King of Kings got on his knees and washed the feet of his disciples. This was the action of a slave, and Jesus did it willingly. Service of others is how the world is transformed. Incredibly, we find that as we serve others, we are ourselves transformed. No wonder Jesus honours those who serve! In following Jesus, we also want to pay tribute to those who dedicate their lives in service. We may not all be able to make sacrifices in the way Suhaila, Ethel and Millicent do, however we can still contribute to their work through financially supporting them. Will you help us support these good and faithful servants by donating to our Easter Appeal? Please support our good and faithful servants as they work for transformation in the lives of others by clicking the donate button at the top or the bottom of this page. Let us introduce you to these servant leaders! 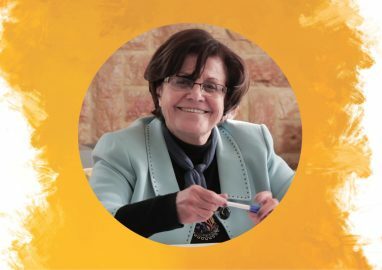 Suhaila Tarazi is the Executive Director at Al Ahli Arab Hospital, where she has worked for 30 years. Our program in Gaza provides breast cancer screening and aspects of treatment to Palestinian women, and works with men and women to address the deeply entrenched stigma attached to the disease. Suhaila has literally risked her life in Gaza as the conflict has seen bombs dropped near her home and near her place of work. Through Suhaila’s dedication, women are now being given an opportunity to not just survive, but flourish. To read more about the Women’s Health and Wellbeing program Suhaila runs, click here. 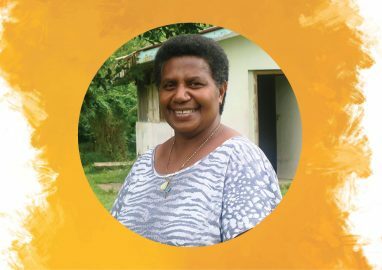 Ethel George is the Women’s Desk Officer at Anglican Church of Melanesia, where she has worked for 9 years. Working with the Mothers’ Union, (the only established women’s organisation in the Anglican Church in Vanuatu), she coordinates programs to help women become more self-reliant through income generation, financial literacy, and savings groups. On top of life’s daily challenges, Ethel has been instrumental in assisting the people of Ambae following the evacuation of the whole population of her home island due to volcanic activity over the past 18 months. Through the leadership and commitment of passionate people like Ethel, communities can begin to thrive. To read more about our Livelihoods and Women’s Empowerment Program, click here. 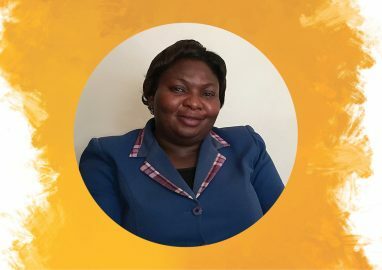 Millicent Wanbugu is the Program Coordinator for the Anglican Church of Kenya in Mount Kenya West. Millicent has been with the Church for 9 years working diligently as a Project Officer before taking on the new challenge as Coordinator. As the Program Coordinator she has taken a lead role in tackling the issue of gender based violence, running the Imarisha Building Safer Communities Project. The project supports women’s rights and safety, educates on child protection, and runs saving and loans groups to promote women’s financial capacity and increase household income. Millicent is committed to the long journey of helping women escape violence and regain their independence. To read more about the Imarisha Building Safer Communities Project, click here. Above left: Suhaila meets with a family who have benefitted from the hospital, which plays a vital role in the community (circa 2000). 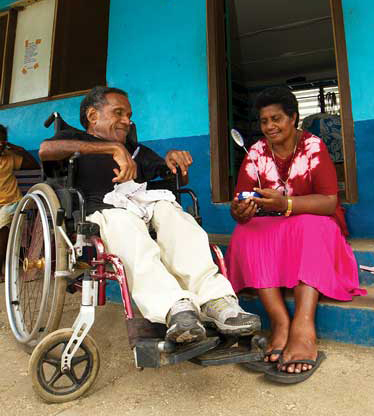 Above right: Ethel visits a family who have opened up a canteen thanks to the savings group initiative she leads in Vanuatu. 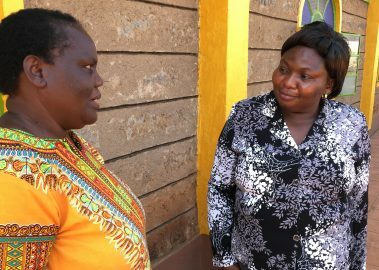 Millicent meets with Dorcas Mwangi, a Curriculum Support Officer who trains teachers on child rights and protection. Funds raised through the Easter Appeal will go towards our General Fund and used to support the work of Anglican Overseas Aid where most needed. To donate to our 2019 Easter Appeal, click on the ‘Please Donate’ button below (choose ’01. 2019 Easter Appeal’ from the ‘Donation’ drop-down menu) or call us on 1800 249 880.